Aircrews of the B-52 Stratofortress hone navigation skills and enhance ability to work with allied partners during Polar Growl training. OFFUTT AIR FORCE BASE, Neb. 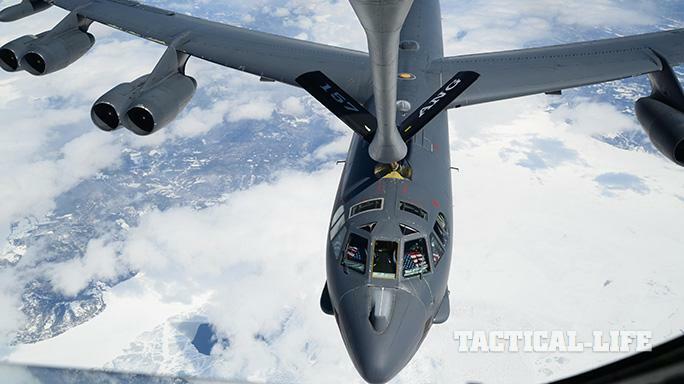 — Two pairs of B-52 Stratofortresses completed simultaneous, round-trip sorties from their U.S. bases of Minot Air Force Base, N.D., and Barksdale Air Force Base, La., to the Arctic and North Sea regions, respectively, April 3. The training mission, coined Polar Growl, allowed the aircrews to hone their navigation skills and enhance their ability to work with allied partners, while demonstrating U.S. Strategic Command capacity. Each of the two legs of Polar Growl provided unique training opportunities, all while testing the bomber force’s command and control apparatus’ ability to support two synchronized flight paths. The bomber crews flying the North Sea route participated in dissimilar air intercept maneuvers with fighter aircraft flown by the Royal Canadian air force, Royal Air Force and Royal Netherlands air force. In addition to conducting dissimilar air intercept maneuvers with Royal Canadian air force fighters, bomber crews on the Arctic leg of the mission transited around the North Pole, providing the crews invaluable training in polar navigation. The U.S. regularly conducts combined training and theater security cooperation engagements with coalition partners. The combined training provided in Polar Growl follows the participation of B-52s in NATO exercise Noble Justification in October 2014, and the deployment of B-52s and B-2 Spirits to RAF Fairford, United Kingdom, in June 2014.